One Goh was arraigned today on seven counts of murder and other charges that could make him eligible for the death penalty for a shooting rampage at Oikos University in Oakland on Monday. Goh, 43, a Korean national who lived in Oakland, has admitted to police that he carried out a shooting at the Christian vocational school that left seven people dead and three people injured, according to a probable cause statement filed in court by Oakland police Officer Robert Trevino. Alameda County District Attorney Nancy O’Malley said the motive for the shooting isn’t totally clear but it appears that he wanted his tuition back after he voluntarily left the school last November and he was targeting an administrator there. However, the administrator wasn’t there when Goh went to the school Monday morning, O’Malley said. She didn’t disclose the administrator’s name. Trevino said in his statement that Goh admitted that he went to Oikos, which is located at 7850 Edgewater Drive, armed with a .45-caliber handgun and four fully-loaded magazines of ammunition. The shooting started around 10:30 a.m. on Monday, Trevino said. Oakland Police Chief Howard Jordan, who joined O’Malley at a news conference at the Wiley Manuel Courthouse after Goh was arraigned, said it appears that Goh fired most of his ammunition but an exact count of the bullets that were fired hasn’t been completed yet. There are at least 10 rounds in each magazine for a .45-caliber handgun, he said. “We can’t recall a crime scene such as this in Alameda County. The enormity and devastation of these crimes is unprecedented,” O’Malley said. O’Malley said witnesses have told authorities that Goh was “a loner and what some might call a loser” but hadn’t exhibited any behavior that indicated that he might go on a shooting spree. In addition to seven counts of murder, Goh is charged with three counts of premeditated attempted murder and 10 special circumstance allegations that could result in the death penalty if he’s convicted. Seven of those allegations are for committing multiple murders and one each are for committing a murder during a robbery, murder during a carjacking and murder during a kidnapping. O’Malley said her office won’t make a decision on seeking the death penalty for Goh until after a preliminary hearing is held to determine if there’s enough evidence to have him stand trial. O’Malley said four of the shooting victims were East Bay residents: Lydia Sim, 21, of Hayward; Sonam Choedon, 33, of El Cerrito; Grace Eunhea Kim, 23, of Union City; and Doris Chibuko, 40, of San Leandro. Two other victims were identified as San Jose resident Judith Seymour, 53, and San Francisco resident Tshering Rinzing Bhutia, 38. The seventh victim was identified in the complaint as Katleen Ping, 24. Three other people were wounded in the shooting. O’Malley identified them as Dawinder Kaur, 19, Ahmad Javid Sayeed, 36, and Grace Kirika, 43. O’Malley said Ping was an administrator at the school and the other victims were students. Trevino said in his probable cause statement that Goh admitted to kidnapping a woman and forcing her from her office into a classroom at gunpoint. He apparently is referring to Ping, as the criminal complaint alleges he murdered Ping during the commission of a kidnapping. Trevino also said Goh admitted that he took the car keys of one of the victim’s and fled the scene in the victim’s car. He apparently is referring to Bhutia, as the complaint alleges that Goh murdered Bhutia during a robbery and a carjacking. 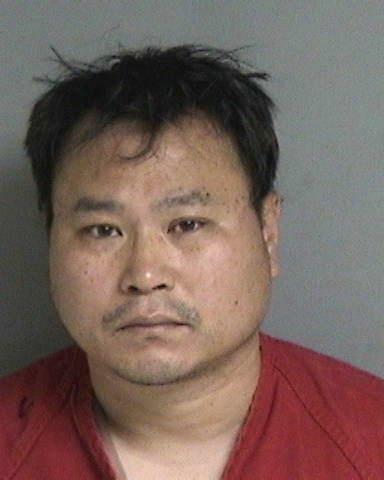 Goh surrendered to Alameda police at a Safeway store at 2227 South Shore Center in Alameda at about 11:20 a.m. after admitting to a security guard that he had shot several people in Oakland, police said. Jordan said police are searching for the gun that they believe was used in the shooting in a waterway between the school and the place where Goh was arrested. Alameda County Sheriff’s spokesman Sgt. J.D. Nelson said his agency’s dive team has helped Oakland police in the search for the gun but nothing has been found so far. It took Alameda County Superior Court Judge Sandra Bean about eight minutes to read all the charges against Goh at his arraignment today. Goh, who was dressed in a red jail jumpsuit and had his hands shackled at his waist, didn’t say anything at his hearing except to answer “Yeah” when Bean asked if One Goh was his true name. Alameda County Assistant Public Defender David Klaus told Bean that he is representing Goh. The judge granted Klaus’ request to have Goh return to court on April 30, when he is scheduled to enter a plea. Bean ordered that Goh continue to be held at the Santa Rita Jail in Dublin without bail.